What a week this has been so far! We have been working our butts off as they say 😮 The spring plowing has all been completed. The logging job is nearing completion and several small projects have been finished. It is good to be caught up again. Last night we got a nice rain. The pasture grasses and newly planted oats all got a welcomed drink of water. Today the air is cool making for a great day to work. I am off to a late start, but started none the less. The rain has slowed the soil prep work , but we are on track again, so it is less worrisome. Corn planting will dominate the next little while, but first I must get the seed, and make a modification to our corn planter. The seed has been ordered since last fall, but at last check, it was still not in? The modification to my corn planter is for the row markers. I hope to plant better once the row spacing has been set. 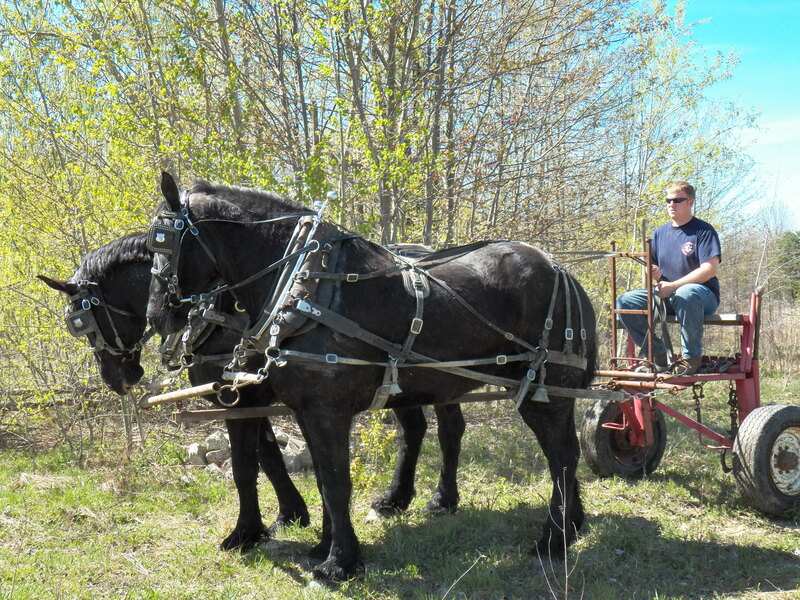 The horses and powercart will plant this year. I’m looking forward to that!